Rockwell Collins has announced the arrival of a new datasheet in our Resources Lounge. 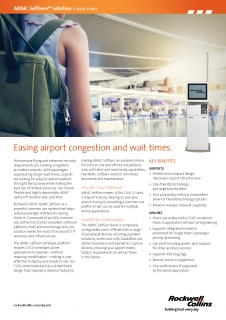 ARINC Airports SelfDrop datasheet is available now to view online or download. Self-service in the airport environment, regardless of size or capacity, can lead to improvements in passenger experience, airport flow and security. With increasing instances of passenger check-in happening away from the traditional airport counter, self-service applications are keeping passengers moving and airports operating more cost-effectively. ARINC SelfDrop self-service solution helps to provide seamless passenger flow, and can be utilised within the airport terminal or off-site in car rental agencies, hotels or convention centres to deliver even greater flexibility. SelfDrop can be integrated with the existing airport infrastructure, and operates seamlessly within current baggage handling systems, including weight and measure applications and conveyor systems. This common-use technology helps secure reliability and offers operators greater capacity without making significant investments into infrastructural improvements or hardware. Using a web-based, secure platform, Rockwell Collins access the required information and systems using cloud connectivity, creating an operational environment that remains scalable and flexible. Rockwell Collins’ ARINC SelfDrop includes a two-step biometric integration process, maintaining consistency and security for the essential review of passenger information. Self-service is increasing in popularity, as passengers gain greater control of their travel experience. With biometrics, the baggage handling system is revolutionised and enables a seamless, end-to-end experience through the entire check-in process. Passengers begin by scanning their boarding pass and passport document. Both digital and printed documents are accepted. Next, if they enrol their facial biometric, which is verified instantly against the image. contained in the passport chip, a name match is performed. Passengers use their face to verify their identity. Passengers drop baggage into the drop off point. Excess baggage payments can be generated, and TouchTag self-adhesive baggage tags fixed. The passenger journey through the airport is simplified and expedited via touch points within the airport where further biometric passenger identification is made. Baggage tagging is an important part of the SelfDrop process, and the system intelligence leaves us with a scalable, secure solution to ensure airport operators can keep passengers moving and operations flowing. Passengers benefit from enhanced efficiency, and airport operators are able to increase terminal throughput on a comprehensive scale. To find out more about Rockwell Collins’ ARINC SelfDrop solutions, download the datasheet now, or contact us for further information.